Happy birthday Dear Karikkad Rasheed Saquafi - birthdaywishes2- Birthday wishes sms,birthday wishes images,,special birthday. 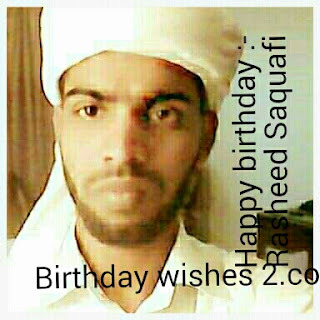 Karikkad Rasheed Saquafi is celebrating his 28th birthday today. He is a teacher in Ma'din Academy.He studied also in Ma'din Academy. School. He is living in Delhi. His date of birth is 12th June 1989.